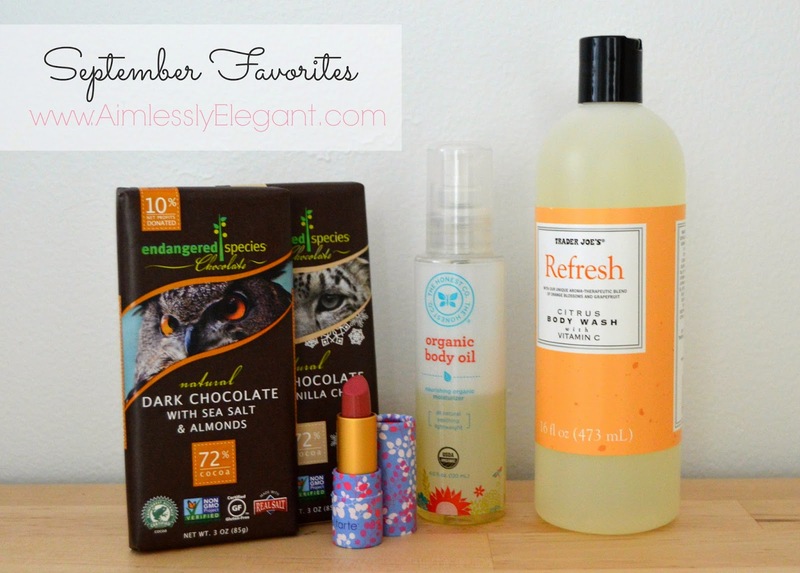 I can't believe it's already that time again for a monthly favorites round up. I swear it feels like the beginning of September was just here, and now we are heading into the second week of October. I'm loving the fall weather and the chance to pull out my boots, as I did for the first time yesterday day! Here are a few things I was loving in September. In my quest to find some great lipstick I picked this up at Ulta. I like that the Tulip color gives me just enough color that you can tell I am wearing lipstick without looking too crazy over the top, since I don't typically wear lipstick this is a good stepping stone color for me. I love the feel of it, and what truly sold me on it was the pretty packaging. I do notice it does dry my lips out some when it completely wears off, so I've been layering it with a bit of lip balm and that seems to help. I'm totally loving this stuff right now for right after the shower. I've talked about my love for The Honest Company before, and here it continues. I love it for many reasons, one it gets delivered to my door. Two, this oil is organic. Three, it's light weight and easily soaks into the skin leaving it moisturized and nurished without any greasy film. The bonus, it's packed full of good for you oils like jojoba, olive, avocado, and more. If you haven't checked out The Honest Company yet, you should, it's so worth it. Click here and you can get a free trial of some of their popular products, that's how I got hooked! So lately I've been told to lay off the added sugars, which is like torture for me and my huge sweet tooth. But I was told I can have dark chocolate, as long at it's above 70%. At first when I was told this I was like great, this sounds disgusting. And the first few bars of 70% + dark chocolate confirmed this, but then one day I was at Whole Foods and spotted these Endangered Species Chocolate Bars. They were on sale 2 for $5, and they were for a good cause (I've always had this thing with helping out the endangered species, when I was in the 4th grade I adopted endangered animals for all of my family members for Christmas). The bonus, they were actually good! So far my favorite has been the Forest Mint, but there are several other flavors I'm excited to give a try, along with their new filled bars which sound delicious. I have this thing with body wash. I don't see spending a whole lot on it because I've never really noticed a difference between those that I do and those that I don't. I know that for the most part they tend to contain a whole bunch of crazy ingredients, and are one of the harder things to create a DIY version of, so I'm always looking for alternatives that don't break the bank. I came across this Refresh Citrus Body Wash at Trader Joe's, and it has now become a staple in my shower. It has a very light clean citrus sent, and it will only set you back about $3. The scent dosen't linger on your skin, which I actually like, and it leaves your skin feeling clean, but not dried out like some others can do. 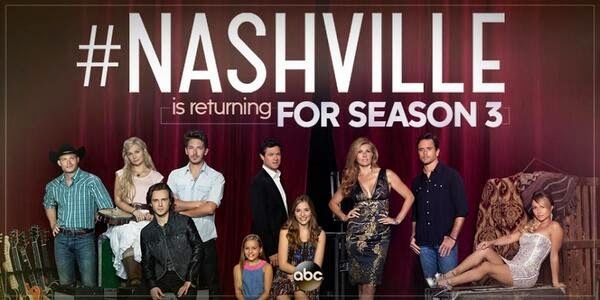 One last thing I'm excited about from September, Nashville season 3 starting. Love this show, and glad it's back on. Tell me I'm not the only one who is still rooting for Deacon?! I've wanted to watch nashville but it's not on netflix so I can't catch up!! I wish we had a whole foods or trader joes nearby so I could indulge my sweet tooth without all the added sugars! That lipstick looks so great! And the packaging is so pretty! That lipstick looks so pretty! Need to see a pic of you wearing it! :) And YES YES YES for Nashville! I still haven't watched last week's episode...I've seriously been saving it for tonight so I'll only have to wait one day to watch the next one. BEST.SHOW.EVER! These seem like great products! Girl, I always will be rooting for deacon - him and Rayna are meant to be! Yes!!!!!! I am so excited for Nashville to be back on!!!! I am definitely rooting for Deacon! I have a feeling this season is going to be crazy! Oh....NASHVILLE! Love it. It's already gotten to a great start. I'm just hoping it ends well. I know :( I got hooked on it through Hulu. When I was looking up those chocolate bars their website said they are also available at the Vitamin Shoppe, do you have one of those close by? The packaging it what sold me to go back for another color! I agree, LOVE THAT SHOW! Nothing compares right now. I keep saying I'm going to get in front of the camera more for this blog, and then I always chicken out! Hopefully I'll get a picture of me wearing that lipstick soon!! Right?! I'm hoping that happens this season! I do too! I can't wait for it all to unfold!! It's so good, right?! Thanks for stopping by! Thank goodness for the internet, order away! !